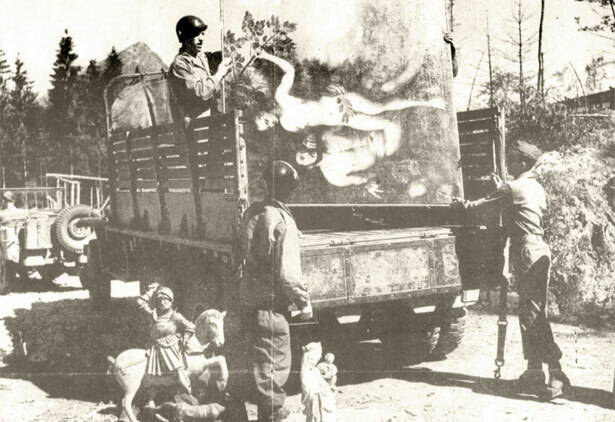 US soldiers load painting of Lovers and other valuable art found in Göring’s Secret cache. During World War II, the Nazis looted everything from major artwork found at national museums to privately-owned Jewish ceremonial and personal items. Fortunately, Nazi records were very meticulous. Our partnership with the National Archives has made it possible to explore these records today on Footnote. During the month of May, all documents from the Holocaust Assets Collection will be free to access. One of the most popular collections at the National Archives, this provides a picture of the Holocaust that many are unaware of. Ardelia Hall Collection: Offenbach Administrative RecordsAdministrative records, cultural object restitution and custody records, records relating to restitution claims, and monthly reports. Ardelia Hall Collection: Offenbach PhotographsPhotographs relating to recovered books and artifacts processed at the Offenbach Archival Depot in Germany after World War II. Ardelia Hall Collection: OMGUS RecordsRecords Concerning the Central Collecting Points (“Ardelia Hall Collection”): OMGUS Headquarters Records, 1938-1951. Ardelia Hall Collection: Wiesbaden Administrative RecordsTextual records created at the Wiesbaden Central Collecting Point include administrative files and monthly reports. Ardelia Hall Collection: Wiesbaden Property CardsProperty cards from the Wiesbaden Central Collecting Point during the period 1945-52. OMGUS Finance Division – Investigations and InterrogationsOMGUS Finance Division Records Regarding Investigations and Interrogations, 1945-1949. Roberts Commission – Protection of Historical MonumentsRecords of the American Commission for the Protection and Salvage of Artistic and Historic Monuments in War Areas, 1943-1946. USACA – German External Assets BranchRecords of the German External Assets Branch of the U.S. Allied Commission for Austria (USACA) Section, 1945-1950. WWII OSS Art Looting Investigation ReportsReports by the Art Looting Investigation Unit of the OSS relating to jewels, paintings, and other art objects appropriated during WWII.